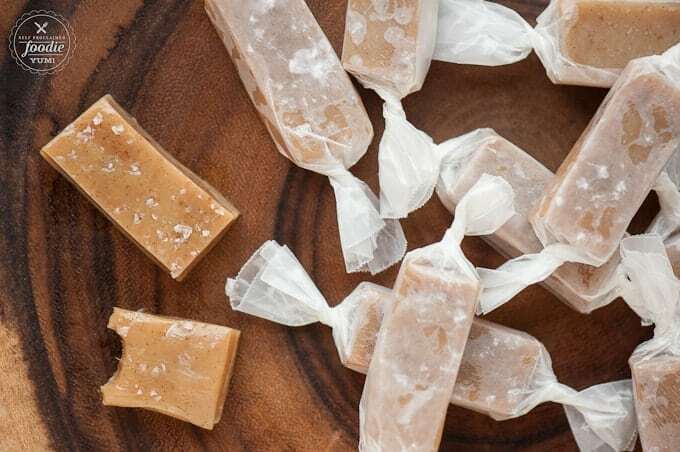 These sweet & chewy homemade Salted Vanilla Bean Caramels, made with the goodness of browned butter and lots of vanilla beans, are the perfect holiday gift! Welcome to Day 7 of my 12 Days of Holiday Treats Series! That means that I’m well past half way done. What on earth will I share next?!? 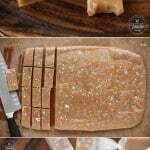 I’ve been wanting to make chewy homemade caramels for my holiday cookie boxes for years now. As much as I love holiday cookies, the overwhelming amount of flour gets a little tiresome. 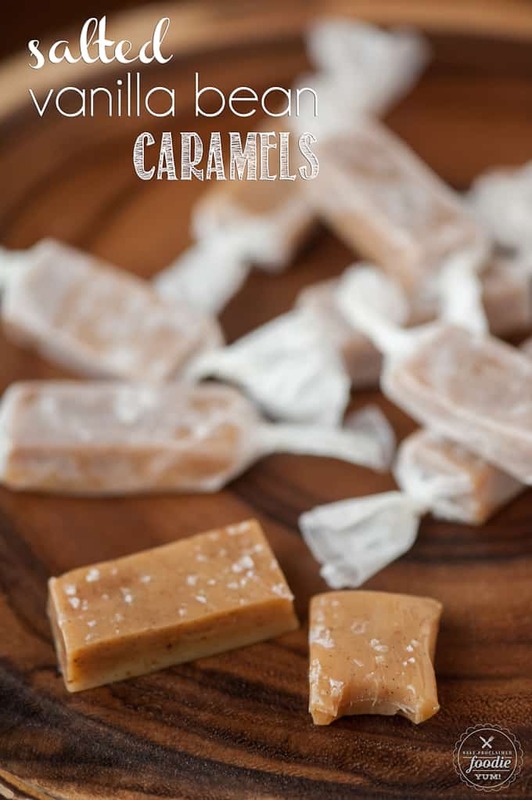 I like to mix it up on occasion with a chocolate truffle or something like these unbelievably delicious caramels. Until this past year, I’ve been deathly afraid of boiling sugar. It all comes back to a tragic gingerbread house incident where I was making homemade gingerbread (yes – long before the days of those easy to make kits) and was gluing the pieces together with boiling melted sugar. Well, I’ll have you know that boiling sugar works fantastic as a glue because it instantly holds the gingerbread together… much like it instantly bonds to your flesh when you sister accidentally spills some on the back of your hand. Yeah. Well. I was finally able to overcome my fear when I made some salted caramel sauce this summer. 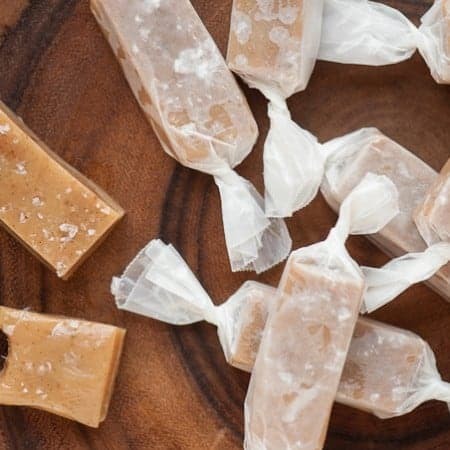 The process is reasonably similar for these caramels in that you need to get it to a very specific temperature to yield the very best results. I don’t have a candy thermometer but I do use my digital meat thermometer . Works like a charm! I also keep my hands protected from the heat by wearing my silicone oven mitt while I stir. I did a few things to take these caramels to good to DAMM GOOD. First, instead of just melting the butter, I browned it first. Then, I used a heck of a lot of vanilla beans. This is a no brainer for me because I just pull them out of the gallon sized jar of homemade vanilla extract that I’ve had soaking in my closet for the past year. I’m a firm believer that everyone should always have at least 20 vanilla beans on hand. Finally, top your sweet caramel with the most delicious flaked sea salt and you have yourself an outstanding treat that makes a fantastic gift! Line a 9 x 13-inch baking pan with foil or parchment lined foil. Butter any sides of the dish that are not covered in the liner. Using a medium to large saucepan (I used an 8 quart because hot bubbling sugar scares me), begin to melt butter over medium high heat. Whisk continually as butter melts and bubbles, scraping any brown bits off the bottom of the pan. 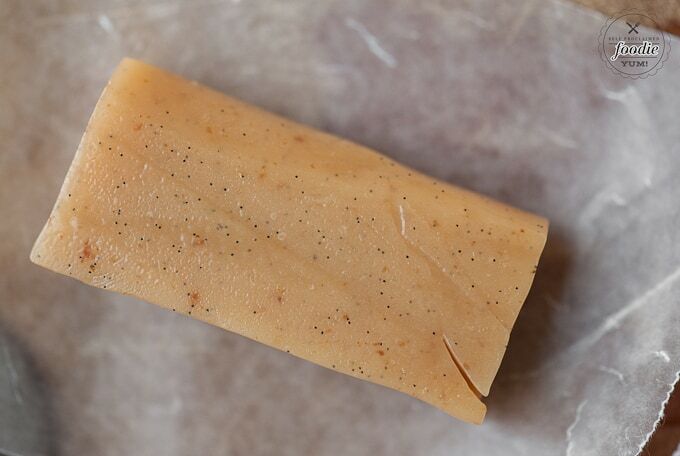 When butter has successfully browned, you will have a wonderful caramel nutty aroma. Remove from heat. Combine the water, sugar, vanilla beans with scraped seeds, condensed milk, corn syrup, and browned butter in the saucepan. Bring to a boil, stirring constantly with a heat-resistant rubber spatula. Continue stirring while cooking until the batch reaches 245ºF. You may need to use a heat protective glove over your hand while stirring. The instant the caramel reaches 245ºF, immediately pour into the prepared pan and remove the vanilla bean pods using a fork. If you do this too early, the caramel won't set. If you take the temperature above the setpoint, you risk having caramel that's hard as a rock as opposed to chewy. As soon as you've poured the caramel, sprinkle the salt flakes over the surface. Allow to cool completely to room temperature, at least 2 hours. Remove the sheet of caramels from the pan. Cut into the desired size pieces using a sharp chef's knife. 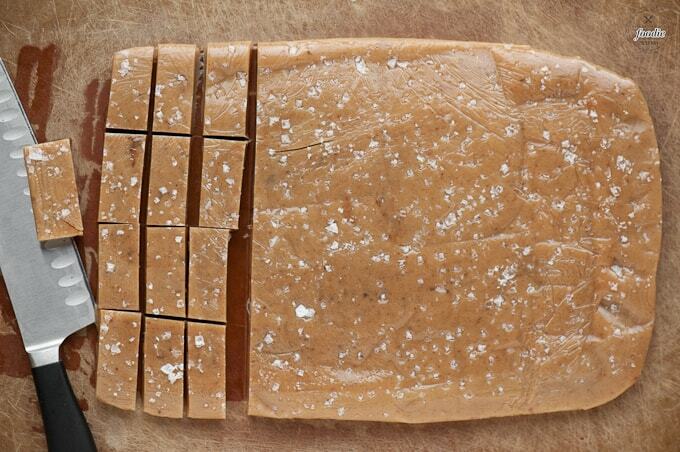 For easy wrapping, caramels may be chilled before handling. Wrap in pieces of wax paper for individual treats. Store in airtight container at room temperature.